This entry was tagged Donegal, football, gaa, Sam maguire, writing. Bookmark the permalink. 🙂 Made it through. Me and the team, both. At the risk of adding to your phobia – it’s the going up that’s bad, it’s the coming down. The first time I attended a Broadway-type production in Toronto was with my grade school class. Of course we were assigned seats in the nosebleed section as they call it. Vertical, narrow steps, I was terrified. It was dark! I made it through! The team too, just barely. Awesomeness Frankie. Haha! 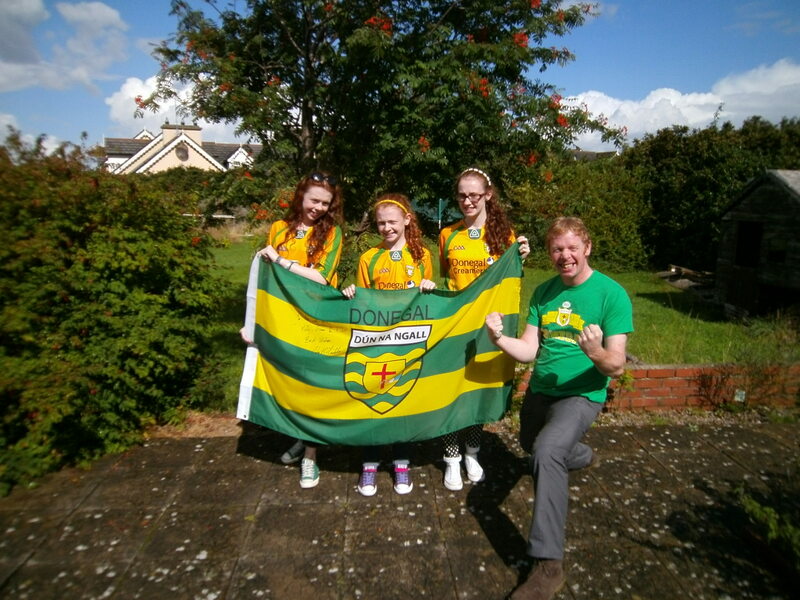 Go Donegal! I feel your pain. I am exactly the same. Could always go up the ladder, but somehow it grew ten feet taller as I turned to go back down. At home we call that the nosebleed section of the stadium. Been there. Done that. Your kids are lucky. Just keep your eyes on the ball. And when you leave just let your feet do the work and watch the back in front if you. Have fun!! Yay football! Made it! I am starting to think maybe every person in the nosebleed section shares the same fear but holds it together for the sake of family and football. A win! The icing on the wobbly cake. Glad you made back to terra firma. That was definitely worth a few gray hairs…congrats on all counts. I don’t do public events anymore but a different phobia is the culprit. Crowds. Given the generally ‘eedjut’ way people behave these days I have a fear of crowds going wild and crushing me and my loved ones. Heights? What heights? hahaha ye are playing great…for now. Left Armagh looking for the ball! Hey your kids look so much like my nieces it’s crazy. Or do you guys say ginger instead of red? Your latest post “Masters of war” blew me away. I couldn’t even find the words to comment. Well, just what you said right here means a lot. My goodness, you are the most cliche’ Irish family I have ever seen!! Ha, ha ha. Beautiful curly red head girls!!!! You must have your hands full Frankie!! First things first, great name for your blog. Now, I share your fear of heights, and I once worked on the mast of ships. Very few people know of my fear, and at times it’s more severe than others. Nevertheless, there are tricks I use to distract myself from concentrating on the heights, like blasting the Foo Fighters and screaming along. But I like your wife’s advice, it’s not about us. Thanks for the great post. Cheers Jim. The thought of climbing the mast of a tall ship is making me weak just to think about it.